Fixed an issue that would prevent expired data from being removed from device after new data is installed, taking up extra disk space. Fixed an issue that could cause a return to home screen when using certain dashboard instruments on maps. Click here for instructions on updating your iPad or iPhone. We recommend that all customers update. Earlier today we issued an updated New York terminal procedures download for the January 12 – February 9, 2012 period. This update corrects an error with the Niagara Falls International (KIAG) ILS or LOC Rwy 28R procedure. 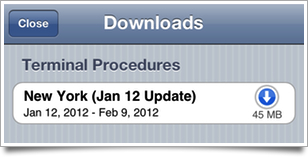 If you have selected New York in your download settings, you will be prompted to download this update.